Picked up a 6-pack from Calandro's... at only $7.99 it seemed like an interesting one to give a try and a great price. I poured it from a 12 oz. bottle into a pint glass... slightly hazy amber color, small head. 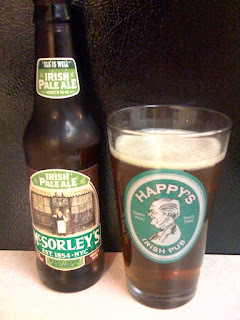 I figured a Happy's Irish Pub pint glass was appropriate for an Irish pale ale, right? I'm taking the proper glassware to the next level my friends. Smells of malt, bread flavors, slightly sweet, not a lot of balance or complimenting flavors. The taste was more of the same. Nothing too bold at all, but a solid drinkable pale ale. I have to say if I was sitting at McSorley's Old Ale House in NYC I could really enjoy a few of these on tap. I'm still kinda bummed that we missed this place when Jay, Brent, Brandon and I all went to New York two summer ago. I'm betting that it tastes significantly better fresh from the brewery to the pub, but as a bottled beer for retail, just not all that spectacular. There are definitely better 6-packs out there for the price. In other news, my place was broken into today sometime while I was at work. The bastards took my old power tool set, a folding table, and a dolly. Not to be TOO insensitive, but I was kinda surprised the tequila was still on the shelf. Only that last bit was a joke.